Lithium-ion batteries are common power sources for cellphones and other electronic gadgets, however they tend to be problematic in extreme cold or heat. A Rice University laboratory has proposed ways to expand their range. Rice Materials Scientist Pulickel Ajayan and members of his lab have published a review that examines latest advance in lithium-ion technology and recommends how to make the batteries more adaptable for extreme conditions. The work reviewed comprises some of Ajayan and his team’s own innovative efforts to broaden the capabilities of lithium-ion, the portable power storage of choice for consumer electronics, electric cars, military applications and more. The review will be reported this week in Nature Energy. In recent years lithium-ion batteries have received a lot of negative press revolving around combusting cellphones and smoking aircraft batteries. But more typical problems like the want for batteries that last longer and charge more rapidly are the major drivers of research. We searched hard to find one paper that talks about all the problems at the same time and what all the individual components experience at extreme temperatures, and we couldn’t find one. So we believe this is a good opportunity to survey the field. The Rice team was most keen to see how batteries work in temperatures from minus 60 °C to 150 °C (minus 76 °F to 302 °F), knowing that existing batteries are engineered to function near room temperature and within a narrow temperature range. In most cases, lithium-ion batteries tend to lean toward either cold or hot operations, which is less than ideal for an electric car being driven from the hot desert to snowy peaks. “People have not looked that studiously at temperature constraints,” Gullapalli said. He stated how frustrating it can be when a phone breaks down in the heat or cold and said charging a phone also increases the temperature within a battery — which is the reason why a phone must never be left recharging in a hot car. Most research involving batteries and temperatures involve management systems: For instance, if a phone is used in cold temperatures, they slow it down a little bit to preserve the battery. But we found in our review that the perspective is changing slightly. To make batteries that work from low to high temperatures, scientists have to take the materials perspective to see what temperature is specifically doing to the materials. Electrochemical batteries have three standard parts: A positive cathode, a negative anode and a conducting electrolyte that allows electrons to travel from one side to the other, while either charging or draining. The materials in each offer chances, Gullapalli said. The Rice team developed an all-inclusive map of both standard and potential new materials in commercial batteries and mentioned their typical temperature ranges and energy densities for each component. 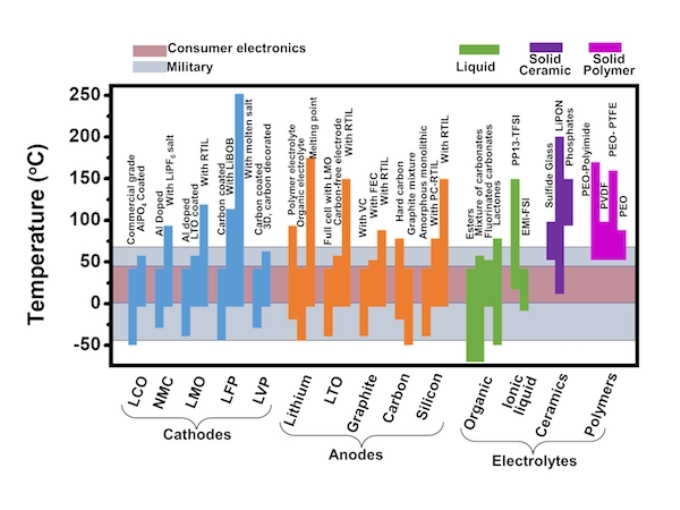 Performance in existing lithium-ion batteries requires compromise, the Researchers wrote. For instance, water-based electrolytes like nickel-metal hydride and lead-acid work only between minus 50 °C and 50 °C, while molten salt batteries operate well only at temperatures above 90 °C. Batteries containing lithium thionyl chloride work between minus 60 °C and 150 °C, but only at peak between 20 °C and 55 °C. Building an ideal or a close-to-ideal system requires a thorough understanding of the subtle mechanisms and replacing each delinquent component with a suitable alternative. A trivial component at ambient conditions can change the whole electrochemistry when exposed to high temperatures. The paper’s Co-Authors are Rice Postdoctoral Associate Babu Ganguli, Graduate Students Marco-Tulio Rodrigues, Keiko Kato and Jarin Joyner; Alumnus Kaushik Kalaga; and Fulbright Postdoctoral Fellow Farheen Sayed. Ajayan is chair of Rice’s Department of Materials Science and NanoEngineering, the Benjamin M. and Mary Greenwood Anderson Professor in Engineering and a Professor of Chemistry.